What's the new OverDrive, and what features does it have? The new OverDrive is a completely refreshed website and app experience that makes your digital library faster and easier to use than ever before. You can still choose your own default lending periods for the digital formats offered by your library. If you want to extend or shorten a lending period for just one title (without changing the lending period for the whole format), you can now do that before you borrow the title. 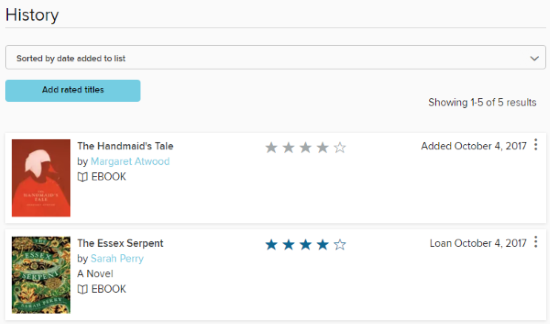 Click or tap to go right to your Loans page and find all of your borrowed titles. 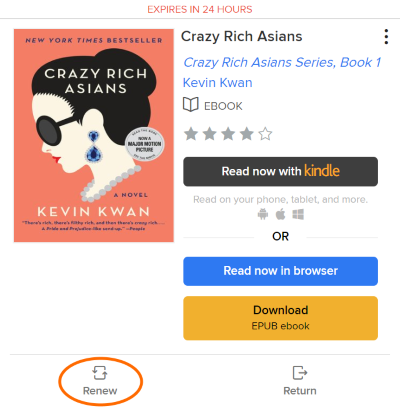 If you only want to see the Kindle Book format for borrowed ebooks, you can make Kindle your reading preference. Learn more about the Kindle preference here. 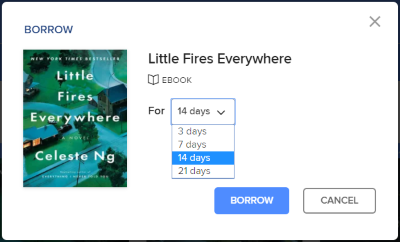 Your History page (under ) automatically lists the titles you borrow. You can also manually add titles to, or remove them from, your history. For example, you can add a print book you read, or remove an audiobook you didn't finish. Learn more about the history here. You can see approximate wait times on title details pages (before you place a hold) and on your Holds page (after you place a hold). After you've placed your first hold (or signed into your library with an OverDrive or Facebook account), we'll remember your email address, and you won't be prompted for it again when you place holds in the future. This way, you can place holds in just one click. You can always edit your email address(es) for hold notifications if you'd like to use a different address. Holds are automatically borrowed for you as soon as they're available. If you'd like to turn automatic hold checkout off, you can do so for your entire account, instead of individual holds. Renewing now extends your lending period for a title (instead of allowing you to borrow it again when it expires). As long as there are no holds, you can select Renew for a title on your Loans page (under ) up to three days before it expires. If the title has holds, you'll be able to select Request again instead to join the title's wait list.